This pre-workout is spot on! 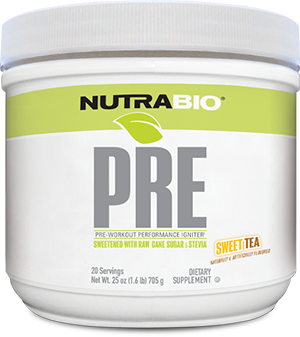 With Nutrabio, obviously the quality and profile is there and that's no different with the natural Pre. I am not a big fan of strong flavorings or artificial sweeteners, and the flavor profile of this is perfect. It's got a very mild, smooth flavor, without any aftertaste or bitterness. The solubility is amazing, nothing fell out of solution even when it sat for a few minutes. The focus and energy were solid, and I didn't have any digestive issues or crashes. This is the first pre-workout I've found that hits all my requirements. I highly recommend this for people who don't like overpowering artificial flavorings and sweetners. This is my first NutraBio product and it's phenomenal. On my first use I broke PRs for bench press and deadlift. I had no jitters or crash afterward. I felt completely focused and I could have continued working out for at least three hours. However, this is NOT sweet tea. It's tea with lemon! I do not detect any sweetness at all even with the five grams of cane sugar and stevia. If NutraBio could improve upon this that would be great. I really like [product name removed]. I realize that contains artificial flavorings, and I wont be going back to that, but maybe NutraBio can find some inspiration from that flavor and find a natural way to create it? Anyway, despite the taste, I will be ordering this again, and I highly recommend it to anyone looking for an excellent pre-workout.